The month of June has flown by and July is here, it’s hard to believe just how quickly this year has gone by, but boy has it been fabulous. With another beautiful month down it’s time for my monthly vintage attire blog featuring my favourite outfits from the month of June. The seasons have been changing to the cooler months in Australia, which has meant cardigans, gloves, and jackets, oh my! Dressing up and playing with vintage styling is one of my favourite ways to pass time. Blouse and skirt: op shop. My husband and I love to spend our weekends vintage shopping whether at a store or market hunting for a thrifty find. June has seen us visit all our favourite stores, and a few Collector’ Fairs finding many beautiful true vintage item. Vintage finds from the Collector’s Fair in Cannington. The Perth Pinup Community hosted several events including hosting a BBQ for the homeless which was a truly rewarding day, and a fabulous coffee catch up. Blouse and skirt: Memory Lane. It’s been a busy month for my fabulous Pinup Academy with weekly dance classes, our Vintage Pinup Workshop with the tropical theme. When I teach I get to share all that I’m most passionate about and get to know some truly beautiful people in the process. I’m so excited for term 3 to commence July 10th! Every Tuesday I’ve had the pleasure of visiting Cherrybomb Beauty Parlour, being pampered with vintage hair styling, hair treatments, cuts and colours, nails and beauty. They’re without a doubt your own stop shop for all your vintage beauty needs. The end of the month has brought flu which is still plaguing me but I’m finally on the mend. I’ve not let that dampen my fun and I’ve enjoyed dressing up especially for party where I channeled some modern 20’s glamour. Blouse: vintage find from Melbourne. I do hope you enjoyed this month’s vintage attire, I’ll have another fabulous blog online tomorrow! 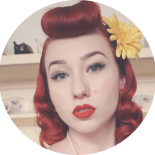 This entry was posted on July 4, 2018 by Miss Lady Lace in daily vintage attire, OOTD, Pinup Life, YouTube and tagged 1940's, 1950's, blogger, glamour, june's vintage attire, miss lady lace, miss lady laces pinup blog, ootd, perth, perth pinup, perth pinup blog, perth pinup community, pin up, pinup, pinup blog, pinup blogger, pinup fashion, pinup girl, pinup life, pinup lifestyle, pinup ootd, pinup perth, red lips, retro blog, retro girl, retro glamour, the perth pinup community, victory rolls, vintage, vintage blog, vintage blogger, vintage fashion, vintage girl, vintage glamour, vintage perth, vintage pinup blog.